On Saturday March 31, 2018 Northshore Emergency Management Coalition (NEMCo) volunteers participated in a statewide communications drill. The functional exercise began at 8:00am with a Request to Report issued via NEMCo’s Alert Northshore notification system. Nineteen amateur radio operators checked into a resource net and were assigned to report to a specific post for the drill. Radio Amateur Civil Emergency Services (RACES) volunteers opened the radio rooms at Lake Forest Park, Northshore Utility District and the EOC at Fire Station 51. 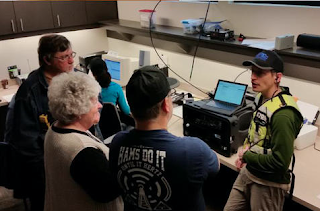 Community Emergency Response Team (CERT)volunteers passed sample damage assessment information to each location and RACES members requested equipment from neighboring cities via HAM radio. During the drill, NEMCo RACES contacted 26 other agencies, including the State of Washington at Camp Murray, Puget Sound Energy, and dozens of cities. After a disaster, HAM radio would be the only reliable communication tool. The Northshore Emergency Management Coalition (NEMCo) is planning an emergency preparedness seminar on June 2, 2018, from 9am-1pm. Once again this year, the seminar will be held at the Northshore Fire Department in Kenmore (7220 NE 181st Street Kenmore 98028). Topics include: Fire extinguisher use and safety, utility shut-off, food preparedness, emergency kits, etc. Reserve a spot by contacting Carl Lunak at clunak@northshorefire.com or 425-354-1744.